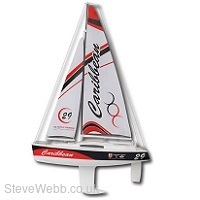 The diminutive 1:46 scale Caribbean yacht offers huge levels of fun in a compact and easy-to-transport package. Don't let those tiny dimensions fool you...this is no toy. The factory moulded cruiser/racer hull provides excellent handling in all but the roughest waters, with an excellent turn of speed courtesy of the pre-fitted rip-stop nylon sails. Accurate control is provided by two separate 9g servos, and Joysway have even provided a 3.7V rechargeable Li-Po battery with its own charging port built into the stylish and easy-to-use 2.4GHz transmitter. Perfect!